Most insidiously, the Left is going after the hearts and minds of our children. Fox News reported several schools are discouraging the reciting of the Pledge of Allegiance while teaching our kids America is the greatest source of evil in the world. Allow me to define “The Left” to Americans like my brother David who is not a political junkie. David is busy working hard, raising his family and only catches sound bites from the liberal mainstream media. In a nut shell, the Left is mostly spoiled brat former 1960s hippies. Their WWII generation parents sacrificed and gave them everything. Consequently, these ungrateful arrogant superior elitists think the world revolves around them. Everything is about making “them” feel good about themselves. They claim ownership of compassion and tolerance. Thus, they pontificate about the evils of America; racist, sexist, homophobic and consumers of way too much of the world's resources. The Left believes the poor around the world has too little because we Americans have too much. These Leftists; Michael Moore, Barbra Streisand, John Travolta and Al Gore to name a few, fly around in their private jets, live in palatial estates and command salaries which could fund a small country. These outspoken liberal elitist hypocrites consume more resources monthly than most of us will consume in our lifetime. And yet, they have the nerve to lecture us about using too much energy and the evils of American capitalism. The Left has an irrational resentment, if not hatred, of America. Insanely, numerous liberal Hollywood actresses support dictators and cultures in which, if they lived in those countries, they would not be allowed to be who they are in America. They would be reduced to being silent and subservient to men. And yet, these screwed up women defend dictators while accusing America of being evil sexist. Their “Blame America First” former hippie parents have trained them well. Excuse my rant. But, that is who the Left is in a nutshell. Now, back to how they are going after our kids. Obama and company are doing everything in their power to “bully” parents into surrendering their children over to them for government indoctrination. In my travels to 200 tea parties across America in many states including Alaska, by far, home schooled kids are more poised, self confident and better educated than public school kids. Please don't take offense. This is my honest observation. A dear friend's son is a 23 year old America hating Marxist. Sadly, this young white male believes American white males are the SOBs of the world. His mom still remembers the day he can home from middle school devastated and in tears. He was taught to feel guilty for the cruel abuse his ancestors and America's founding fathers perpetrated upon native Americans and blacks. Folks, the Left is going after our children. Kristen Campbell is a tremendously brave high school student. I love this kid's backbone. Kristen wrote a piece published in her school newspaper disagreeing with Michelle Obama. Kristen was called a racist. Her car was vandalized. The wrath of loyal Queen Obama supplicants, black students, parents and local church groups, came down hard on this child. Kristen was verbally and physically attacked. Folks, I'm talkin' serious. Kristen was even threatened with a knife. Still, Kristen remains bold and outspoken in her defense of conservatism. Isn't college suppose to be about the free flow of ideas? Leftist faculty at Rollins College is out to get a student, Jamie Pizzi, for daring to write an opinion piece on “anchor babies.” These so-called ambassadors of tolerance are only for free speech when you are spouting liberalism. Conservative speech is swiftly met with severe punishment until it is silenced. They're goin' after our kids, folks! I watched a video with young black males dressed in military attire performing like a military drill team. They were saying "Because of Obama I'm inspired to be an architect, engineer and etc." On the surface, this message might appear "positive." I say, what a huge slap in the face to our great nation. 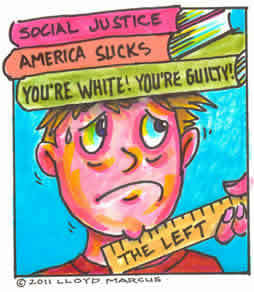 Sadly, the democrat's years of teaching blacks they are victims of racist America have been extremely effective. So, blacks were not free to achieve until Obama? Totally absurd. The video shows further indoctrination of the black youths by having them espouse the virtues of Obamacare. ALL LIES! Most insidiously, the Left is going after the hearts and minds of our children.